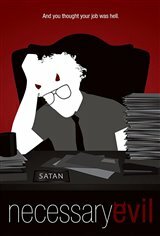 Azmodeus (Randy Brososky) is a cubicle-bound drone in a sea of cubicle-bound drones at a company called Hell LLP, where devils and demons work together to speak evil throughout the world. Dedicated to doing things the right way, not the easy way, he is often in conflict with his co-workers and supervisors, who are, after all, demons, and are obsessed with cutting corners, grasping for power and basically all the bad behaviors that any corporate environment encourages. Az is powerless to do anything about it. One day, a phone call changes everything, when he's summoned to the top office. He discovers that Lucifer has retired, and has selected Az to replace him as CEO of Hell LLP. In trying to learn the ropes, Az finds out that he's unprepared for the role, which comes with new, powerful enemies, limited resources, and a threat to the very fabric of Hell that he must solve. With the help of his Advocate, Persephone (Kimberley Philpott), he faces other power-hungry demons, office politics, and physical dangers while trying to unravel the tenuous clues that Lucifer has left behind. What he finds will tip the balance, and teach him just what is necessary about evil. Canadian Connection : Filmed in Alberta. The cast and crew are Canadian.